The Magna Carta Ambassador programme is now entering its 6th, very successful, year. It started out as an Anti-Bullying incentive which the school won “The Diana Award” for in 2013. In 2015 Wellbeing Ambassadors were introduced. This year the 2 programmes are merging and they will be known as “The Ambassadors”. The Magna Carta School is really proud to have its pre-emptive anti-bullying culture firmly embedded into not only its policies but also its every day school life. We have a strong student volunteer team of Ambassadors who everyday give up their lunchtime to be a friendly face for other students. 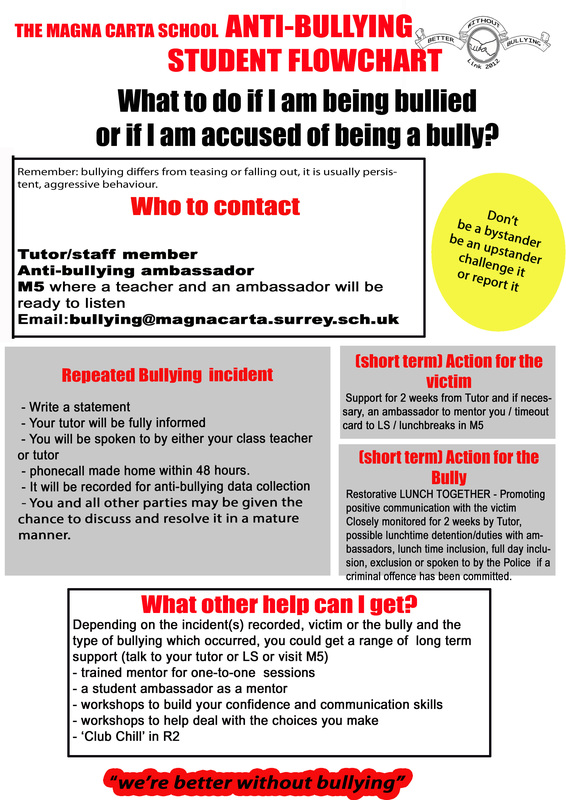 Any student can approach with a problem of bullying or a wellbeing concern. They will listen and take action immediately by getting the incident reported and relevant help sought. The Ambassadors will support students for the duration. We offer a pop in lunchtime room, M5, which is open every day. The Ambassadors and adult support is available. The Ambassadors take reports and encourage students to be resilient and empower them to take control of the situation they find themselves in. We also offer 1:1 mentioning support and a space where external agencies can come and work with students. We operate a referral system through HPL’s, SEN, SLT and DSL. Parents and students alike can request a referral. The school has developed an app called ‘My TeenMind’ that covers body image, eating disorders, depression, puberty and sexual health. The idea of the app is to offer 24-hour support on their phone with specific advice on where to get help in the school and in their community. It has been rolled out for all tutors to use with their tutees, offered to parents to use for conversations with their children and of course as a resource in PSHE lessons. Any school in the world can download and use the app free of charge. The app has been developed with a Year 9 Media class, Gaia Technology and local charity Woking Mind. There is a mental health mood tracker for students to identify patterns with their mental health, and students are advised where to access help at the school or in the community. A 9 minute PSHE film resource about the harmful effects of energy drinks called ‘Energy Drinks: What’s the harm?’, financed by Runnymede Borough and directed by past student Henry Lynch, made together with The Magna Carta students this has been an outstanding example of collaborative civic journalism. Energy Drinks: What’s the harm?